Kailua 8 bd. 5.5 bath remodeled home with garage. 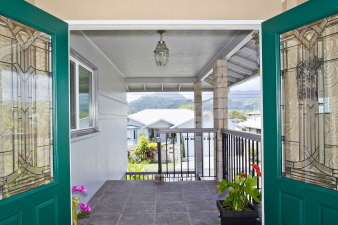 Kailua home featuring 4 bedrooms, 3 full baths upstairs with new kitchen, flooring, split air conditioning, new windows and walk-out tiled lanai. Additional downstairs 4 bedroom, 2.5 baths, with living room, kitchenette, covered lanai, and separate entrance. Total of 8 bedrooms, and 5 and a half baths. Upgrades throughout. Perfect home for multi-family living or rental. Two-car garage. Driveway. Fenced and walled yard with sliding front gate. Indoor laundry area. Value priced at $899,000 Fee Simple. Call Vickie Graham RA Century 21 All Islands for showings at: 808 218-5057.